Being able to watch your favorite sporting events and win cash at the same time is what makes legal real money sports betting so popular. Legal sports betting is essentially like getting paid for something you already love to do. Each year, online sportsbooks pay out millions of dollars to those smart enough to take advantage of the best odds and betting lines. Every wager will not be a winner, but developing the right strategy will ensure that you have success betting on sports with real money. With all of the resources provided by online sportsbooks – including handicapping tips, wagering guides, and 24/7 customer support – gamblers of all experience levels can enjoy real money sports betting, safely and legally, no matter where in the US they live. There are now more options than ever when it comes to US real money sports wagering, but the practice is not available in all areas of the country. For the most part, it is still greatly recommended that in order to enjoy the most rewarding, convenient, and safe sports betting experience, you should stick with legal offshore sports betting sites. Is Sports Betting For Real Money Legal? Due to the somewhat confusing status of sports wagering in the US, many bettors are left to wonder if sports betting for real money is even legal. The overall answer is “yes”, however, there are still certain details that you should be aware of. Betting on sports for real money from a land-based perspective does present some large limitations since such is currently only available in a handful of states. This is because, until just recently, the Professional and Amateur Sports Protection Act (PASPA, 1992) was in effect and restricted sports betting to Nevada (as well as Oregon, Delaware, and Montana, though these states could not offer anything even remotely close to the wager types that NV could). Essentially, then, Nevada and Las Vegas had an effective monopoly on real money sports betting in the US. Back then, if you resided outside of NV, you needed to do all your single-game legal sports betting online and could not bet on sports for real money with any licensed local bookies. However, as stated, the PASPA saw its end in 2018, when – on May 14 – the US Supreme Court overturned PASPA as unconstitutional, opening the door for all states in America to legalize their own sports betting industries. That doesn’t mean that sports gambling is now suddenly legal all throughout the country, though. Instead, each state will (or won’t, in some cases) legalize the pastime in their own time, with the established gambling-heavy states taking the lead in the immediate aftermath of PASPA’s elimination. States like Delaware, New Jersey, West Virginia, Mississippi, Pennsylvania, Rhode Island, and New Mexico all had customer-facing brick-and-mortar sports betting lounges up and running before the end 2018. Other states have legalized sports betting but currently, do not have sportsbooks opened. New York, Arkansas, and Oregon all have legalized sports betting but no sportsbooks are available yet. Other states are expected to follow soon. Still, most folks can’t get to these states or their sportsbook venues. To that end, there are far fewer restrictions when betting on sports online for real money. There are no federal laws that prohibit residents from using foreign-based online sportsbooks to wager on their favorite sports. Most online sportsbooks will accept bettors from all 50 states and you are able to wager on any sport of your choosing. You can legally bet real money on sports online because most states have not taken the time to write any legislation that says otherwise and the existing federal anti-gambling laws (namely the Wire Act and the Unlawful Internet Gaming Enforcement Act, or UIGEA) don’t criminalize individual bettors, instead going after illegal commercial bookmakers and payment processors operating domestically. These online offshore sportsbooks we recommend to you are outside of U.S. jurisdiction and are completely legal for you to use. Before getting started, you should learn more about your options when it comes to betting on sports for real money. Not all sites are made equal, and you want to make sure that your cash is being put in the right hands. It is also wise to get an idea of how bonuses and other perks work in order to get the maximum benefit out of a real money sports betting site. Our personal experience with using nearly every legit online sportsbook in the industry puts us in a position to give honest feedback on the best real money sports betting sites out there. Most sports fans have already heard of Bovada well before signing up at the real money sports betting site. 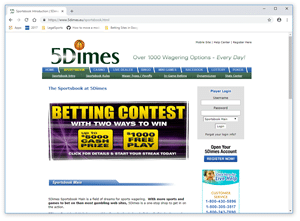 The odds posted at Bovada online sportsbook are often featured in articles from ESPN, the Washington Post, and other reputable news outlets. The operator caters toward American bettors, with betting lines on NFL, MLB, NBA, NCAA, and other popular US sports leagues. Some of the betting options include moneylines, totals, point spreads, parlays, and a wide selection of prop bets. Bovada offers a reasonable new player bonus that will instantly give you more money to wager with. With the 50% Welcome Bonus, the cashier will match your initial deposit by 50% for up to $250 in free plays. The bonus can be used on any sport and wager type, and there is only a 5-time rollover requirement. Just visit the “Bonus Page” to redeem your offer while making a deposit. If you are ready to start using one of the top 3 US-friendly online sportsbooks, join Bovada! BetOnline is one of the best real money sports betting sites for US players, and they have been in the industry for more than a decade. The site offers legal sports betting options to residents all 50 states. You can bet on football, basketball, baseball, tennis, hockey, and tons more when you join the BetOnline sportsbook. When you sign up, you can rest assured that all the banking methods are 100% secure and safe for real money sports betting. Bitcoin, which has become the leading banking method for US sports bettors, is now accepted by the cashier at BetOnline, as are various other cryptocurrency altcoins (Ethereum, Litecoin, DASH, etc.). You can deposit anywhere from $20 to $25,000 and your funds are guaranteed to be posted to your account almost instantly. Bitcoin withdrawals are just as reliable, with a payout minimum of $20 and a maximum of $10,000. There are never any fees for Bitcoin deposits or withdrawals, either, and your funds are always sent/received quickly. You can start betting with Bitcoin at BetOnline today. BetOnline even offers a 100% 1st Time Crypto Bonus (worth up to $1000) for those who kick off their wagering career at the site with any form of cryptocurrency. All you need to do is enter the promo code CRYPTO100 at the cashier to receive this bonus. SportsBetting launched in 2003, though the operators of the site have been in the online gaming industry for decades. 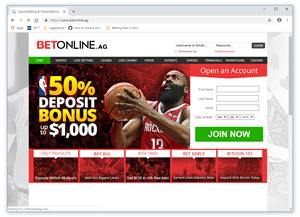 This real money online sportsbook prides itself on offering a wide variety of sports to bet on, from football and basketball to darts and eSports and everything in between. You will also be able to bet on non-sport political and entertainment betting odds. If you ever have questions about a particular wager or general account inquiries, SportsBetting also has a number of 24/7 customer service options. Representatives can be reached by telephone, email, or live chat through the site (desktop and mobile). SportsBetting has huge bonuses that you can actually trust. With their 50% Welcome Bonus, the online sportsbook will match your first deposit by 50% for up to $1,000 in free plays. You are eligible for the bonus with a minimum deposit of $25, using code SB1000 while at the site’s cashier page. The bonus comes with a 10X rollover that must be met before making any withdrawals, however, though this is not a problem for most bettors. SportsBetting sportsbook makes their bonus conditions clear so that there are never any surprises. Join SportsBetting for an exciting sports betting experience that you can trust! 5Dimes is a fantastic online sportsbook for professional and recreational bettors alike. You will find more sports to bet on at 5Dimes than you will anywhere else, and there are more than 1,000 betting options daily. 5Dimes is known for having the best odds and rewards, such as their industry-leading, exclusive Reduced Juice lines on your favorite sports. The real money sportsbook is also jam-packed with special features, such as mobile and live betting, and they’ve made their name by offering more alternate lines and unique props than any other book on the Internet. 5Dimes also has a one-of-a-kind free betting contest that can earn you up to $5000 in cash. The contest, open to all 5Dimes customers, asks users to consecutively win on specific events to build the highest score on the monthly Betting Streak leaderboard. There are prizes for consecutive winning streaks of 5, 10, 15, and 25 correct wagers. You get a $50 free play for 5 wins, and the amount gradually increases up until the $5,000 cash prize for 25 wins. Just go to the “Betting Contest” section of the site and follow the instructions to play at 5Dimes. BetDSI, licensed and regulated in the Republic of Costa Rica, is one of the best places that you can bet on sports online, especially with their overhauled, mobile-friendly website’s fresh, easy-to-navigate design. 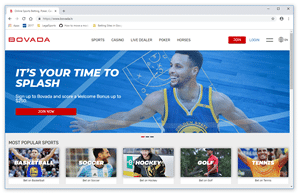 When you join BetDSI, you can bet on all of your favorite sports like NFL football, NBA basketball, MLB baseball, boxing, NCAA football, and a whole lot more. There are even entertainment and political betting odds if you want to wager on events outside of traditional sports. With BetDSI’s user-friendly sports betting platform, you can easily make a deposit, place wagers, and request payouts. BookMaker Sportsbook – 15% CASH Bonus Up To $600! BookMaker is in a league of its own when it comes to providing an entertaining sports betting experience. With over 30 years in the industry, the operators of BookMaker have created an online sportsbook with the best selection of sports, wager types, and bonuses. You will find the latest, freshest betting odds on football, basketball, baseball, hockey, eSports, tennis, and more. Your betting options include straight bets, parlays, teasers, if-bets, round robins, and other exotic wagers, and SportsBetting is number-one in the industry in setting fair, competitive lines. Their slogan – “Where the line originates” – isn’t just lip-service. 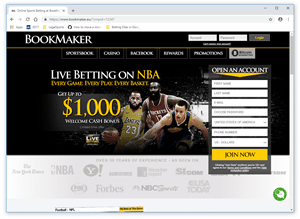 BookMaker is the best online sportsbook for high rollers and dedicated sports bettors, catering to big money wagers and rewarding consistent play with a host of consistently valuable member perks. When you join BookMaker, you can immediately claim their 15% Cash Welcome Bonus – the only cash bonus in the business – when you deposit with Bitcoin or another supported payment option. The cashier will match your initial deposit by 15% for up to $600 in CASH. To be eligible, just make a deposit and enter the promo code offered by the site upon creating your account. There are plenty of other bonus offers that you can take advantage of when you sign up at BookMaker, as well, and you can also enjoy the site’s fully-fledged online casino and racebook. Real money online sportsbooks for USA players will only have the most reliable and legal sportsbook deposit options available. 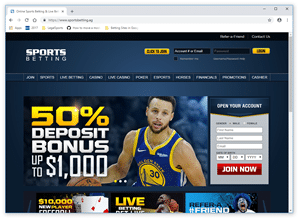 Before joining a sports betting site, you will be able to view its Cashier page to make sure that there are suitable deposit options that actually meet your needs. 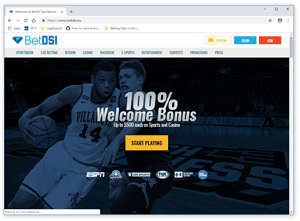 The best real money sports betting sites will have instant deposit options where funds are transferred electronically, such as Visa or MasterCard. That said, we recommend using Bitcoin, which is the fastest and most dependable deposit option for US sports bettors who want to load up their accounts with large sums of money. Other deposit methods offered may include MoneyGram, Western Union, and cashier’s checks. For high roller sports betting, bank wire transfers are the only method with no maximum deposit limit. The site’s cashier will disclose any additional fees on applicable deposit methods, though these are usually negligible or nonexistent. One of the biggest fears for most sports bettors is that they will make a deposit, earn money, and then never actually get the cash. At legitimate real money sportsbooks, this is never an issue. You will be able to request a legal sportsbook payout at your convenience, and you can always count on your funds being delivered. Bitcoin is the best real money withdrawal option because the cash is 100% guaranteed to arrive quickly, often within just a few hours. There are also no withdrawal fees when you cash out in Bitcoin, and the payout limits fit the needs of nearly every bettor. Checks are a more traditional withdrawal option, with funds being delivered to your mailbox in a week or two. Bank wires and person-to-person methods like MoneyGram can typically be requested, as well, though these also have multi-day wait times. In order to get the most cash to your wallet, many online sportsbooks will offer payout discounts where associated fees are waived or reduced for their regular customers. You can find out the specifics by looking through your site of choice’s FAQs or speaking with a customer service representative. One of the main benefits of using a real money sports betting site is that the bonuses are humongous. Nevada sportsbooks simply can’t compete when it comes to instantly increasing your bankroll before a single wager is placed. Most sites will have a welcome offer that will match your initial deposit by a certain percentage. The match percentage will often range from 25% to 100%, and the maximum bonus amount can sometimes clear $2500. You can also take advantage of free bets, refer-a-friend bonuses, and seasonal offers on events like March Madness and the Super Bowl. Bonuses can be quite advantageous – just make sure to read the terms and conditions. You will have to meet a rollover requirement before making withdrawals associated with any accepted bonuses, but these are generally easy to meet, especially considering that real money sportsbook bonuses can be used on any sport and wager type offered. Is Sports Betting For Real Money Safe? Sports betting for real money is completely safe. There are no federal laws that ban using offshore online sportsbooks, and the majority of states do not have Internet betting laws of any kind on their books. You should always verify your state’s laws, but even the few states with sports betting legislation focus solely on penalizing operators rather than bettors. The sites that we recommend for real money sports betting are all licensed and regulated for your protection. You can feel confident when using a trustworthy sports betting site to bet real money on sports. Real money sports betting sites can be trusted with your hard earned cash as long as you stick to the ones that we list. These legitimate online sportsbooks are 100% secure, protecting both your personal and financial data. Your bank account and credit card numbers are encrypted, and the sites use verification techniques to protect you from fraud. When you use a real money online sportsbook, you can trust that the operators want to create the safest sports betting environment possible. For even greater privacy and protection, you should consider using a cryptocurrency like Bitcoin to fund your account. Can I Win Money Betting On Sports Online? With the right betting strategy and handicapping, anyone has a chance at winning real money betting sports online. The key is to be sharp enough to win the bet, using a combination of stats, player insights, and historical data to make the best bet possible. Stay on top of injury reports and all other news that could potentially impact a wager. Though winning is never guaranteed, there are plenty of bettors that are able to successfully make money with online sports betting. In fact, all it takes to become profitable with your sports wagering is that you win about 53% of the time. The best pros make a great living winning only 58% to 62% of their wagers. Are There Any Real Money Sports Betting Apps Available? Yes, nearly every real money betting site has a mobile betting app – or at least a mobile site that works just as good as an app. With these apps (or “web apps”), you can make deposits, claim big bonuses, place wagers, and make withdrawals. You can still access special features, such as live betting lines and live statistical streams of major games. The convenience and flexibility that mobile sports betting sites offer is unparalleled. Most mobile sports betting apps require no download whatsoever. You can simply visit the real money betting site from your smartphone or tablet. Bettors can log in with the same account that would be used for the desktop site, and the sites all run like butter whether you have an iPhone, Android, or other modern mobile device. How Old Do I Have To Be To Bet Real Money On Sports Online? The age that you need to be to bet real money on sports will depend on the laws in your state, but we can assure you that you have to at least be 18 years old. Some states have set their own sports betting age requirements, which should always be adhered to. (Most states in the US, however, have no such sports betting limits.) For example, if your chosen online sportsbook accepts players at 18, if your state law mandates that you be at least 21 to bet on sports, you should definitely err on the side of the law and wait. Otherwise, you are at risk of getting in trouble for underage sports wagering, even if that outcome is extremely rare in practice. What Does It Mean To Shop Lines? When you “shop lines”, you are comparing the sports betting lines at multiple online sportsbooks. Pro handicappers always shop lines to find the best value, and so should recreational bettors. This practice is the single biggest, most effective way to get a real sports betting edge and increase your bottom line. Chances are, whatever the contest, the lines at different books will differ slightly, and this can add up to an enormous value over time. Line shopping also puts you in the best position to spot any line movements that could work in your favor. Being on the right side of a line movement is the difference between a losing and a winning bet.